This post is a few days late, but I arrived on the scene almost three weeks late way back when (sorry Mom!) so maybe my lack of timeliness is appropriate. (Maybe it's just habit now?) I had a great birthday. It always catches me a little off guard to learn that I'm a year older. You'd think I would have gotten used to that by now. But I don't mind getting older. I wouldn't trade what I know now to go back to being younger. Ignorance is too high a price to pay for youth. I have looked for Autumn Journal in every bookstore I have ever stepped foot in. I have hunted it at every garage sale, in every used book store. I have scoured eBay for it, I have run rampant all over the web and I've never been able to find it. Until May 27th. While searching online for another book altogether I came across an online book seller I had not seen before. As always, I did a search for Autumn Journal with no expectations whatsoever. Imagine my surprise when my search turned up one result. There, in a little bookstore in Illinois, was a single copy of Autumn Journal. Needless to say I proceeded directly to PayPal and one day in the next two weeks I will finally hold in my hands the book that has had a hold on me for so many years. When it arrives, I will be taking it to the beach to read. It just seems fitting to take it to the place I go to commune. I'll make the coffee. After work I headed over to Gord & Shannon's where a feast awaited. There was steak on the grill and twice baked potatoes in the oven, grilled veggies and fresh, cheesy garlic bread. Shannon is an amazing cook and I was very happy birthday girl! After the feast, there was cake. Cause, really, what's a birthday without cake? Also, I like cake. So that worked out well. Kendra is gifted in the making of cakes and this year's did not disappoint. Vanilla cake, layered with pudding and strawberries and topped with whipped cream and chocolate dipped strawberries? Happy birthday to me. Fortunately, there were several of us to eat all that yumminess. Coli was happy to get in on the cake action. Tucked in my birthday present from Amanda was a ribbon that read "Kiss me it's my birthday!" Corrina got some help form her Dad cutting out the pieces but pasted it all together herself. I think it's fantastic and can't wait to Skype her and say so in person. Or close to it. Inside she drew me a picture which I'm told is a Mommy lion and a baby lion. Her Dad did the interpretation and he would know about these things. He's quite the artist himself. The glitter, as promised, was plentiful. I think I sparkled all night. I think going to Disneyland for my 30th birthday three years back was a truly stellar idea. So far this whole thirties thing has been going well. I wonder what will happen this year? Oh, and Mom, you asked me to take a birthday picture, so here you go. See you in THREE WEEKS!!!!!!!! Doesn't it sound like something magical is just about to happen? Whenever I think of this poem and of stories and campfires in general, I can't help but hope that the tales he is spinning will be long ones. I love to read long stories and I have a habit of telling long stories (I'm working on that). There is something truly delicious about stumbling upon a new world that's wrapped up a tale that lets you hang out there for a while. Reading a good book is like dreaming with your eyes open and like a truly great dream, it's wonderful when you don't have to wake up right away. I love an author who lets me linger. On the recommendation of a fellow book lover, I recently dove into the Twilight saga. Yes, I know it's a vampire love story written for teenagers, I never claimed it was high art. But it is a well written and delicious diversion. And it is a looong story. Like eating a warm brownie when you know should eat broccoli, this isn't stuff you can live on, but it makes for a great weekend. Today I finished book four, and after 2379 pages it's time to say goodbye to Bella and Edward, Carlisle and Esme, Emmet, Rosalie, Jasper and Alice. I feel a little bereft. There are rumors of a possible book five. 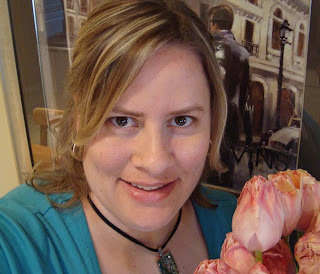 Stephanie Meyer was working on a concept piece when it was leaked online and in protest she lay down her pen. The partial manuscript is on her site and I'm still debating if I'll read it or not. It seems unlikely to get picked up again, so if the rough draft is all there is I probably wont be able to resist. I can help wishing that there was more. I'm not sure what it is about these books that has so captured people's imagination. (They were insanely popular long before Robert Pattinson embodied Edward in the movie version and set a generation of teen girls on fire.) At its core it is Romeo and Juliet -- the classic lovers who cannot be together. But while I get annoyed with Romeo (every time I see that play live I want to scream at him "she's not dead!!" even as I am also secretly hoping that this time it will all work out) Edward and Bella do a pretty decent job of figuring out just what this love will cost them and whether or not that is a price either can afford to allow the other to pay. They are surprising adult in their rationality (I supposed it helps to be over a 100 years old) and at the same time, surprising chaste in their love. Meyer puts some lovely devices in place and does and admirable job of sticking to her own rules even when they inconvenience the plot. So here I am at the end of another satisfyingly long story. I loved what Meyer did with the story. I suppose if I get really lonely for the raining world of Forks, Washington I can always go back to the beginning and read it again. Committing to a long story is a bit like falling in love, you know going in that there's a decent chance you'll get your heart broken. The trick is in discerning when it's going to be worth it. G.K. Chesterton wrote, "Fairy tales don't tell kids that dragons exist, they already know that. Fairy tales tell kids that dragons can be killed." Sometimes grown-ups need to be reminded of that too. It's May long week-end, which on this coast of the country means that gardening season has officially begun. 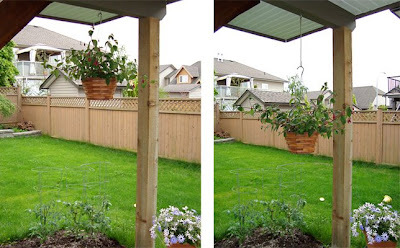 If you headed out to your favorite greenhouse to pick up a hanging basket too, try this easy trick to instantly make your basket appear bigger, fuller and yes, even more beautiful. This process involves no harsh chemicals or dubious horticultural practices. It cost just 98¢ at my local greenhouse. All you need to do is adjust the height of your basket. Most of us use the same hook year after year and pay little attention to where the plant ends up. But unless you either a) use a very long hook or b) have a very low deck the result is a basket that's hung too high. Instead of gazing at your beautiful fuchsias, your eyes are stuck staring at the plastic bucket they were planted in. It's exactly the same principle as hanging art in your house. All too often art is hung too high for the eyes to easily see. Remember the rule galleries use the world over: gallery height puts the center of the painting 57" up from the floor which is the average human eye level. This makes it easy for your eyes to go right to the most important part first, in this case, the flowers. Take a look at the pictures below. It's exactly the same basket in both shots, taken from the same perspective on my patio. In the photo on the left, the basket hangs from just the hook in the deck and appears small, almost swallowed up by the cedar basket. In the photo on the right I've added a 1 foot s-hook, my 98¢ purchase from the greenhouse. Now you can see much more of the plants. The fuchsias appear larger and fuller and once the blossoms open, they're going to be spectacular. Obviously, if your baskets are in a high traffic area then safety concerns will limit how low your basket can go, however it's rare to find a basket people actually walk under. Take a look at your own hanging baskets. You might find that a simple s-hook can make a world of difference. 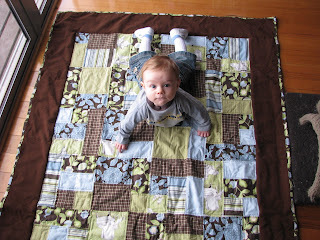 Earlier this week I was thrilled to see photos of Kai on the quilt that I made for him. It certainly takes a looong time for packages to get to Australia. 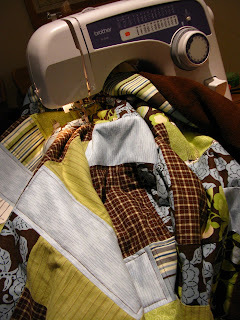 As long as you can cut straight and sew a straight line, you can't go too far wrong with Yellow Brick Road. The last time I made the pattern I did it square, this time around I made it as a rectangle which made it a little harder to cram into my little sewing machine. Being an old pro at this now, I decided to make this quilt one of the thinner style and quilt down each individual square. 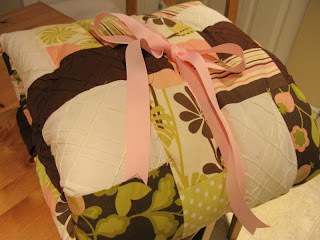 There is a name for this type or style of quilt. I have no idea what it is. The result is a blanket that can stand up to all kinds of wear and tear and with the slightly larger size, I have visions of a four or five year old Kai cuddling under it while watching Saturday morning cartoons. One extra piece of equipment that I bought this time around which turned out to be indispensable was a 1/4" quilt foot. 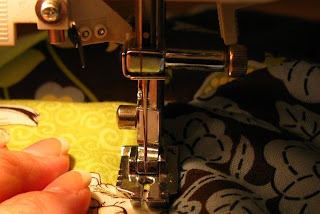 Most quilt patterns call for 1/4" seem allowances, smaller than the 5/8" that is used for dressmaking and so clearly marked on most machines. This little $15 foot made it so much easier to sew a straight 1/4" that I will never attempt quilting without it again. As Thomas would say, it is "a very useful engine". And now, on to the book. 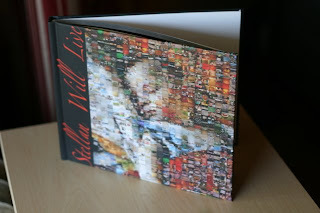 If any of you follow MckMama's blog then you're familiar with the story of her youngest son, Stellan. Stellan has a heart condition and his parents were told during pregnancy that he would not survive. God had other plans. As I was looking through the few pages of the book that have been posted online, I saw that the photo I sent it made it into the book. That's my cake on the left. The verse below it reads, "How sweet are your words to my taste, sweeter than honey to my mouth! Psalm 119:103" How cool is that? 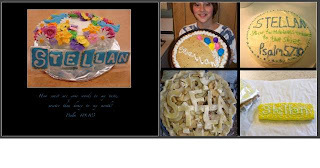 Stellan's birthday happened to fall on the day after my cake decorating class so I added his name in sugar to the final project we were working on. Who knew it would find its way into a book? Sweet deal :) It has been a good week for all things hand made. I've been thinking that I need a new Christmas stocking. I still have the one I've had since I was six, but it's in a sorry state. The red fur is beyond "well loved" and deeply into Velveteen Rabbit territory. The little gold letters have curled up and dispersed, reducing my already short name to merely a-i-r. It was time. I did some research (obviously) and, of course, the design I liked best is discontinued. Fortunately, through the magic of the internet, this small detail did not stand in my way. Here's the kit for the stocking I'm making and given that there are well over 100 pieces, it's a good job I'm starting in May. Here's what I have so far -- just the snowflakes and my name. It took a little work to get my name straight and centered but it turned out well. The name was done in a stitch I've never seen before. If you look at it close up you can see that it's all loops chained together with each link securing the one before. It was a little tricky to get into the rhythm of it. But once I found my grove it came together in an hour or two. I'm excited to see how it will all turn out. For now it's only beginning to look like much of anything.